As seen in the film. Relive the romance of the major motion picture Nights in Rodanthe starring Richard Gere and Diane Lane, based on the bestselling novel by author Nicholas Sparks. Shot on location in the title Hatteras Island village of Rodanthe, you can now immerse yourself in the movie and visit the actual places on the Outer Banks of North Carolina seen in the film. Pictured is the real oceanfront cottage portrayed in the film. Your romantic getaway here, as the wild and wonderful beaches of the Cape Hatteras National Seashore beckon. 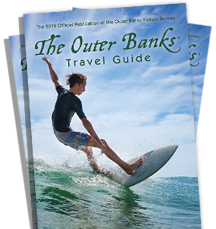 Discover what Hollywood found on Hatteras Island and step into the big screen Outer Banks for real. Diane Lane’s character (Adrienne) comes to the Inn to manage it while the owner goes out of town for several days. This house was used in filming all exterior “Inn” scenes. Work was done to change the look of the house before filming began. New windows, blue decorative shingles, a weathervane, a new sign, extra porches and railings, extra decking, and shrubbery were added. Richard Gere and Diane Lane spent many days here filming scenes. Several shots with the use of a helicopter were also filmed here. These days, the Inn at Rodanthe is a vacation rental home. So you can live like a movie star, at least for a few days. Located between Oregon Inlet and Rodanthe. The 6000-acre refuge is a haven for more than 360 species of birds. From spring to autumn, a large variety of wading, shore and upland birds can be seen. Just before you enter Rodanthe heading south on highway NC 12, there is a set of twisty turns in the road. In the movie, at these turns on the ocean side of the road, a scene was filmed involving a herd of “wild” Outer Banks ponies. Today, you can park your car along the road and cross over the dunes to see this popular stretch of beach known for its natural beauty and dynamic shore. In the movie, this is where village residents and inhabitants go to purchase their storm supplies before the storm hits the island. The exterior of the building was filmed only. Diane Lane was filmed here. The small store at the Pier was used to film interior shots of “before the storm” activity. Also, a large “we survived the hurricane” party scene, involving 400 extras and most of the principal characters were filmed here at night. The wind speed was 25-30 mph that evening and filming lasted until 4 am! Both Richard Gere and Diane Lane were filmed at this location. Aerial and ground shots showing Richard Gere arriving on Hatteras Island via ferry. Exterior shots of Richard Gere and Diane Lane walking/talking on beach with old station in the background. This location was the Base of Operations (and the first stop each day) for the cast and crew during entire filming on the Outer Banks (2 ½ weeks). Costume shop, makeup trailer, catering trucks, machine shop, cast and crew trailers, business offices, and various other vehicles were located here. Every day of filming began and ended here.